Historically the Baltic Sea region has acted as a major transport corridor both in itself and for the rest of the world; during the Middle Ages the Hanseatic League, uniting towns around the Baltic Sea, formed the most dominating trading bloc in the world. Today, the Baltic Sea region is the fastest growing business region in Europe. Trade flows between the countries of the region have increased constantly year by year. Estonia is a sea country – the length of the coastline (3,800 km) is about 6 times longer than the mainland borderline. Therefore it goes without saying – seafaring and port business have long traditions and a mayor impact on the whole country. 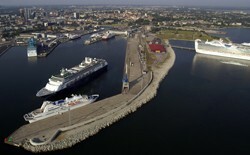 In order to fit effectively into the competitive environment, Port of Tallinn underwent a complete restructuring process in the mid 1990s by developing from a service port into a port of landlord type. In 1999, the last cargo handling operations were finally given into the hands of private companies. Today, Port of Tallinn operates as a landlord type of port with no cargo handling operations of its own. It is maintaining and developing the infrastructure of the port and leasing territories to terminal operators through building titles giving the operators an incentive to invest into superstructure and technology.